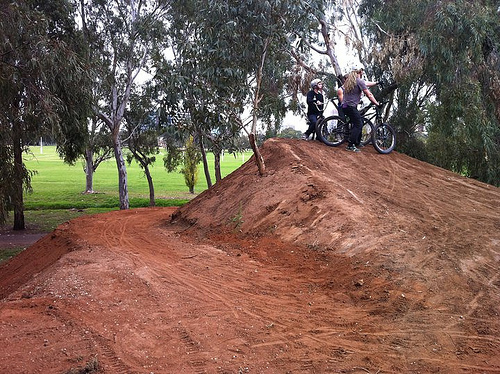 Above, the jumps after a working bee in preparation for the 'Chromoly Crown' competition. City Dirt was opened in 2004. 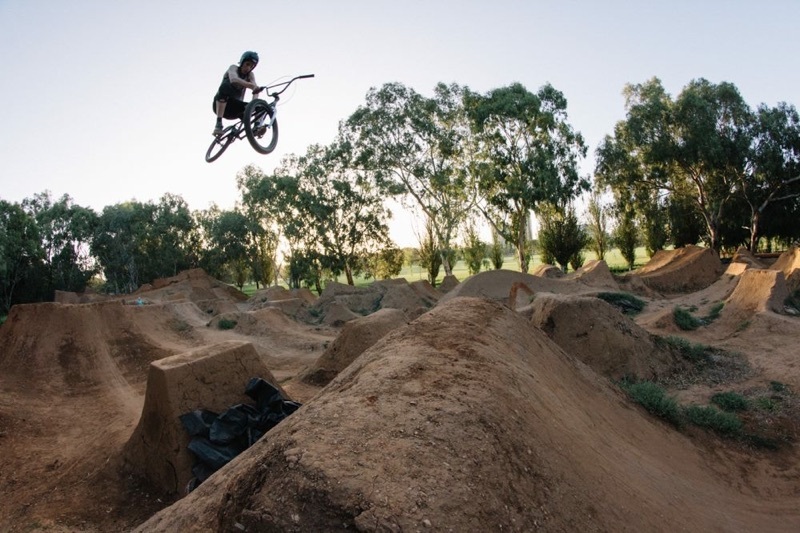 Zoli Borbassi and his company Volatile Visions cut through significant red tape to secure a prime location and bring legal trails to the heart of Adelaide. To this day the legal status of City Dirt remains one of it's greatest strengths; thanks to hard work of people like Zoli and the progressive attitude of the Adelaide City Council. 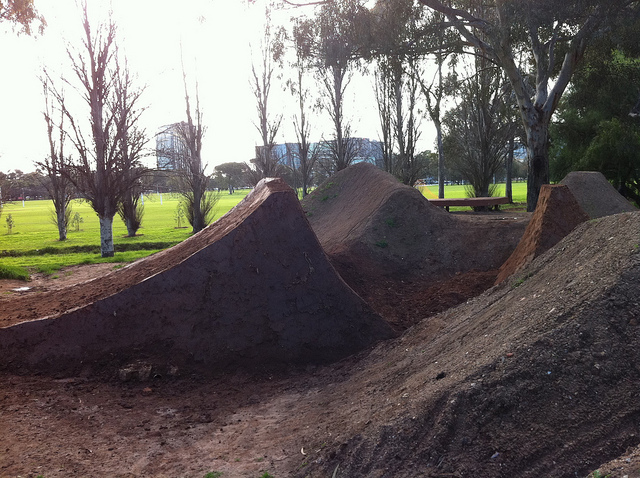 Over the years the jumps of City Dirt have always been characterised by the people who built them. Initially set-up as sets of three and running the length of the park, the jumps were more orientated towards competitions and tricks: well spaced with long landings and a straightforward run-in. The bikes were diverse; with everything from BMX to DH mountain bikes hitting the park as riders honed their tricks for the next jam. Unfortunately, as people moved on, the park slipped into decline as fewer and fewer were willing to contribute to the necessary maintenance. 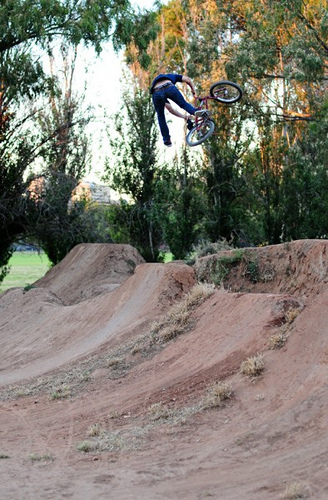 Despite this, instigators like Zoli built a strong foundation for the dirt scene in Adelaide to grow into what it is today. By 2009 the trails had become a dilapidated dust bowl resembling a moonscape; complete with pits and craters. 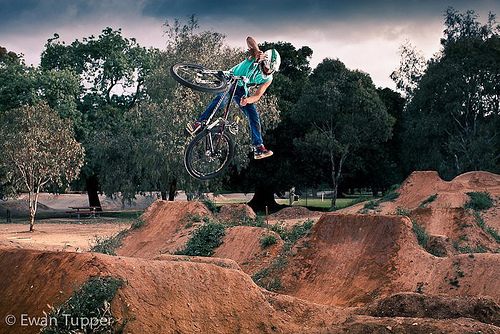 The few riders that worked up the courage to ride the sketchy lips often became discouraged by the general run down nature of the jumps. It was at this stage Nigel and Callum started to ride City Dirt because of its proximity to their homes. Both were interested in seeing the jumps improved and began digging despite very limited water access and no place to store tools. While this made for tough digging (and lots of dry riding), the trails slowly started to improve. Above, freshly moved earth and additional features. 2010 saw a turning point for the trails. Nigel approached the Adelaide City Council for assistance and found that the facility was scheduled to be torn down, having been deemed an insurance risk due to its poor condition. Fortunately the Council were willing to reevaluate their decision and formed an agreement to keep the trails. As part of the agreement new dirt and earth movers were brought in to fix some of the more significant pot-holes and alter the inefficient drainage. Importantly; a water point was also installed and one of the existing benches was converted into a tool box. Callum and Nigel also became official ACC volunteers to maintain and continue to upgrade the trails. 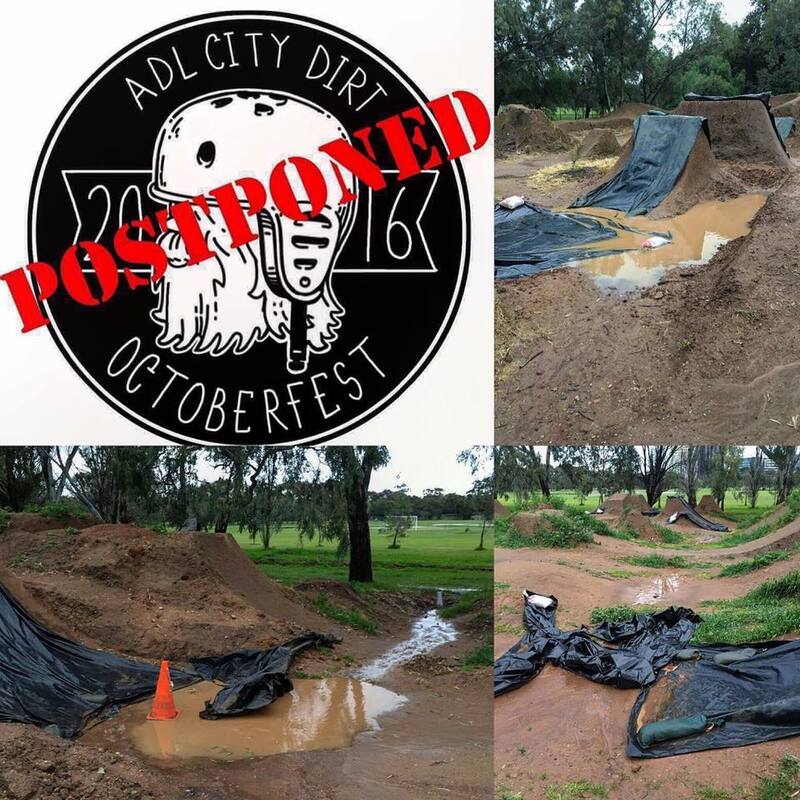 While the earth moving appeased the council and fixed some of the most glaring problems, the overall park layout very much competition specific and conditions hadn't changed much. The new intent was for jump trails which meant long lines of multi-directional jumps mixed with other features like berms and rollers. Achieving this meant creating a downhill gradient for the whole park (the jumps had been built going uphill, limiting speed) and redirecting the drainage to prevent the park flooding in winter. In order to achieve this, one end of the start hill was built higher than the other to make a definitive starting point and provide more gradient. At the lower end of the start mound a small hip into the 'Right Set' was begun while a berm-to-step-down entry to the 'Ten pack' line was also created. The 'Left Set' was reversed in direction to become the 'Return Set' and linked via the 'Return hip', which was built beside the benches at the back of the park. This meant a rider could ride 'Right Set' to 'Return Set' and do a complete loop through 8 distinct jumps. In 2011 the focus was on improving what we had begun the previous year. 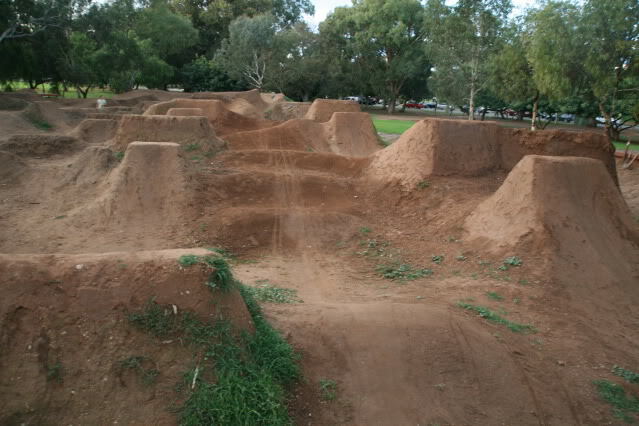 The jumps were generally built squarer, thicker and wider; gradually the whole park started to take shape and ride with more flow. The 'Ten pack' gained a larger entry berm while the rest of the start hill was again upgraded becoming higher and wider. 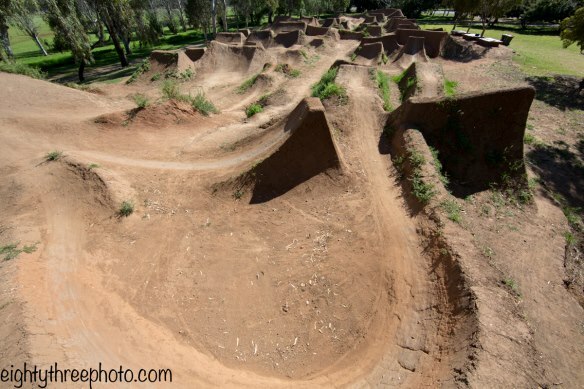 A pump track circuit was also built through the unused parts of the park. Little Black Bike and Stowaway Distribution organised a flood relief jam in March and Zoli organised another Chromoly Crown, putting on the competition in May. Local rider Tom Hall took home first prize with a 720 over the first of 'Right Set' and donated the $100 prize money to the trails. Both events demonstrated the progress we had made was being well received and encouraged us to push the trails further. 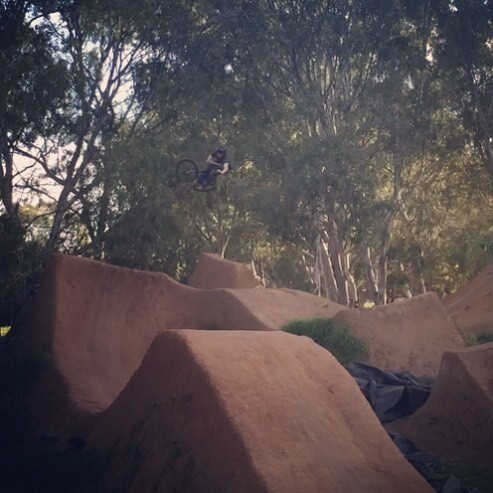 The local scene had developed at the trails significantly by 2012 with a regular crew that was keen to ride and sometimes even dig. Similar to the previous year, stacking and packing focused on further improving the existing lines and developing a second 'Return Set'. This alternate return line was beside the original and had two entry points; a slightly awkward left transfer and the more predictable whale-tale feature. Entry into the 'Right Set' was fine tuned with the addition of a technical speed-jump before the main three jumps. After showing the council some of the issues with existing tool storage they converted another bench into a second tool box that provided more room for tools, including a wheel barrow. Lights were also purchased which enabled digging at night. This meant we had more than enough tools for people willing to help and also that the short daylight hours of winter did not limit progress, which significantly benefitted the trails. 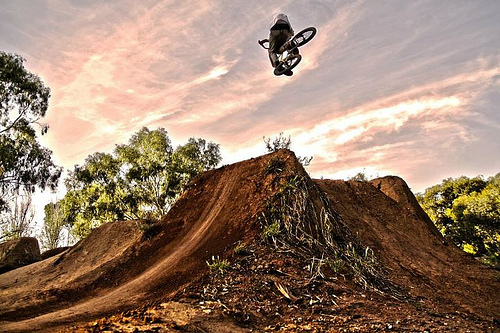 Kane Naaraat began regularly taking photo's at the trails, many of which were featured on websites and magazines and helped document the increasing number of riders. The photo's were also used heavily on a newly created Facebook page which was used to further promote the facility. The page enabled a convenient point of contact for riders, with regular updates on new work and current conditions. In 2012 the first Octoberfest event was held with the help of LBB and Stowaway Distribution. 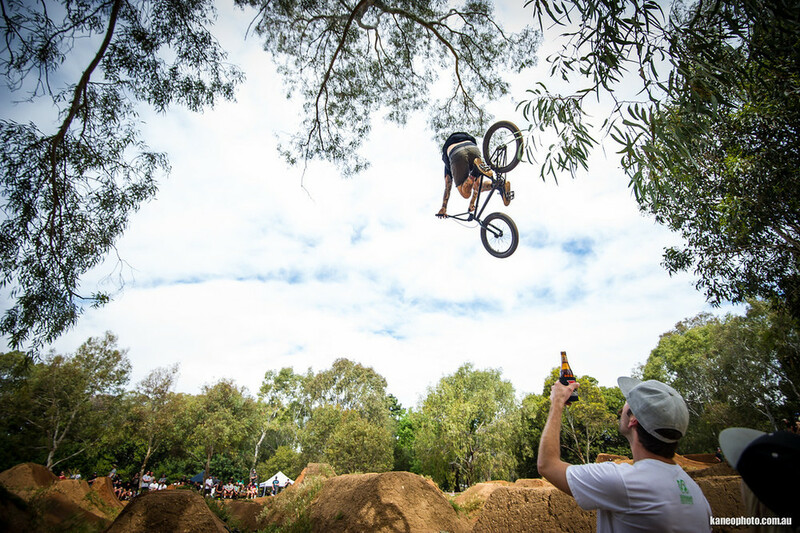 Taking the format of a laid-back 'good vibes' focused jam, Octoberfest was one of the few trails focused events in Australia and successfully attracted local and interstate riders. Holding an official event solidified the already building positive sentiment towards the jumps and enabled money to be raised to fund improvements and additions in 2013. Below is some content that came out of 2012. 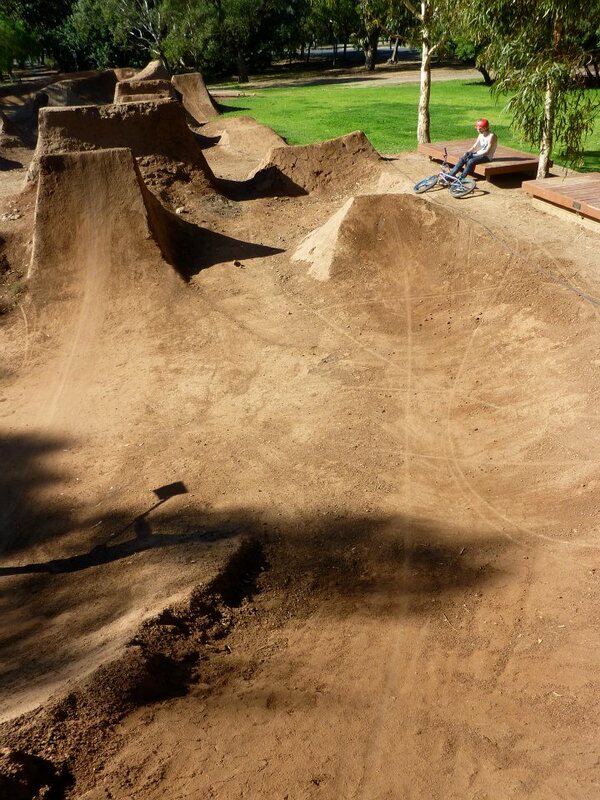 2013 was a big year for the overall layout of the trails with three new line options being built. 'Speedline' was begun in late summer and was to be a real change from what had previously been built (focused on going as high as possible). Situated between 'Right Set' and the benches, someone riding Speedline was able to to pickup enough speed to overtake riders using other lines. This opened up new possibilities in the way trains of riders could move through the park and made for some interesting trial-and-error combinations. As summer faded a long-planned rebuild of the 'Ten Pack' began as the set had fallen into disrepair and disuse because of its poor spacing, uphill gradient and a singular direction. The old line was pulled down and the dirt used to create the replacement; 'Fiskars', which was built on a downhill gradient with wide variety of well spaced jumps. This marked a significant moment in the way the park was being changed as this was the time first an existing set had been redesigned and rebuilt. During the same period Angus Samson begun digging regularly and set to work building a Shark Fin through the middle of the Right Set. Eventually becoming the beginning of the 'Shotgun' line which snakes through the previously dis-used centre of the park and finishes at the return berm at the rear of the park. This berm now accommodated three lines feeding in it and was built significantly larger to handle this. Finally, our biggest project 'Sausage Fingers' was created. Nigel and Callum took a week off work and along with help from others, dug continuously for nine days through rain, hail and shine. 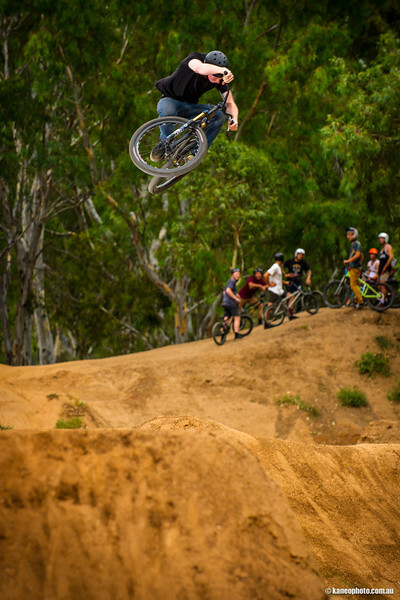 Running as an option beside 'Return Set', 'Sausage Fingers' was designed and built for maximum size and the jumps provide more airtime than any others in the park. As October approached we once again built up the start hill in time for the Octoberfest Jam, which improved on the success of the previous year attracting significantly more people to ride and spectate. An Instagram account was also established to complement the Facebook Page and further increase our engagement. To top off this epic year the ACC also installed a permanent tire pump at the trails. Below is some of the content that came out of 2013. By 2014 almost all of the original lines of the park had been revamped or entirely rebuilt with the exception of the original beginner line 'Mini Rhythms'. The neglected and under-used line still suffered the same gradient and pacing issues of many of the original jumps. Similar to the 'Ten Pack-to-Fiskars' change, we removed the old line entirely and spent our entire winter building a new lead-in/beginner line called 'Milkbones'. 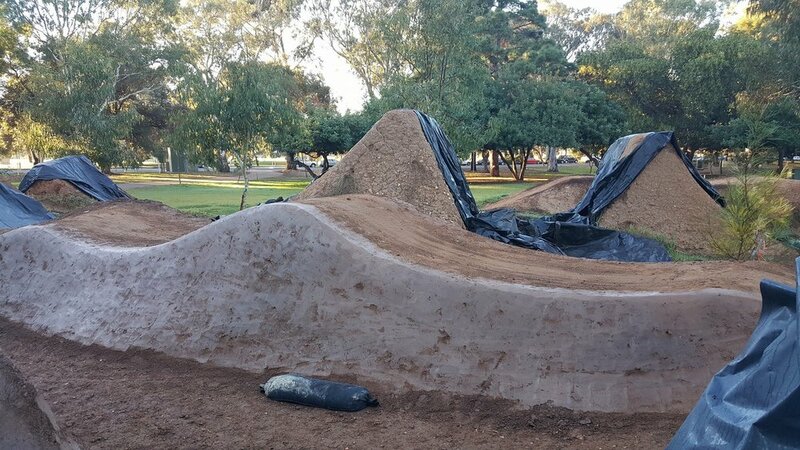 The new set more than doubled its predecessor's number of jumps and was designed to mimic the features found in every other set of the park; incorporating rollers, hips, berms and a variety of doubles. The line's diversity made it a great way of warming up and ensured a clear progression for the park from the smallest to largest. Our third Octoberfest Jam was successfully held with the help of LBB and CTN imports. While we generally aim for the jam to simply be as 'fun' as possible, the turnout was definitely the largest yet, which provided us a another measuring stick of how the profile of the jumps had grown. Below is some of the content that came out of 2014. Building on building is the best way to describe 2015. After some five years of working with the council on signage, two new signs were finally installed. Not only do they look good, they provide more information about how to use the jumps and are a great reference point for the public to gain an understanding of what City Dirt is about. Proper signage like this was a huge advantage in the process of educating and has helped resolve many disputes over track use and care, which had previously been a major head ache. The second major boost to the infrastructure was the installation of three additional water points around the park. The ability to run two or more water points at reduced the jump prep time before riding from around 45 minutes to just 15 and made general maintenance much easier. Digging was focused almost entirely on the start hill. To begin with, the berm into Fiskars was re-built by pushing it back and making it roughly twice its previous length. The starting point of the start mound was built into a higher platform accessed by steps and leading into a small step-down entry into both 'Right Set' and 'Fiskars'. These changes were a realization of a dream we started in 2009 and meant the trails could now be ridden with minimum effort thanks to a downhill gradient throughout every line. Further to this, a step-up/fly out jump was added to the end of Milk Bones bringing the whole set up to ten jumps in total. Throughout the year we also worked with the Council and Lighthouse Youth Projects to deliver a number of BMX skills clinics over the school holidays. 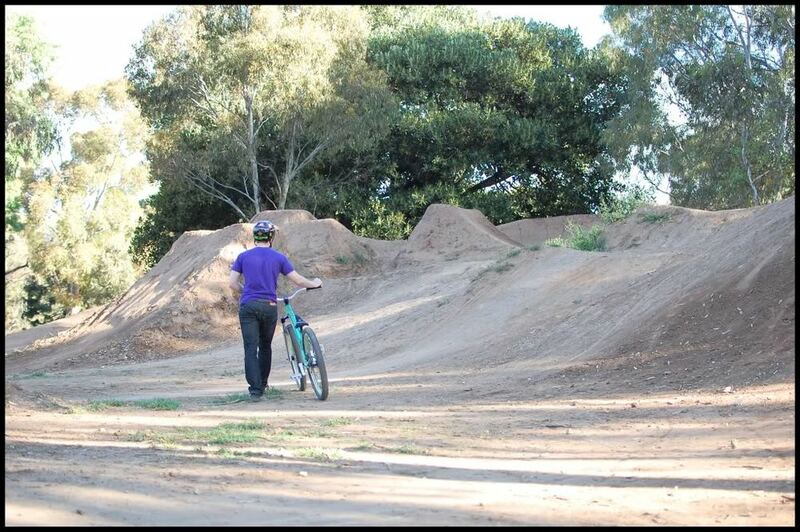 Seeing the jumps getting more kids stoked on riding bikes provided a great insight of possibilities for the future. Along with LBB we also organised the 4th Octoberfest. The weather was the best year with far less wind than previous years and a super chill day was had by all. Below is some of the content that came out of 2015. Surfing dirt is how some people describe riding trails, and just like surfing weather plays a big role in trails. 2016 was one of the most memorable years for weather at the trails; January to May were all-time perfect for riding, but quickly forgotten once the rain started rolling in and didn't stop. While great for digging, by the time rolled around for Octoberfest the sun still hadn't emerged with any consistency, forcing us to postpone for a month or so. Unfortunately the weather refused to cooperate during the second attempt as well, forcing it to be reduced to a small ride day. The year turned out to be the second wettest year on record which meant there was a whole lot of digging. Starting with 'Right Set', the double roller after the hip was changed into a single 'Mega Roller' which generated more speed and enabled us to increase the size the jumps afterwards. The lip on the second of right set was also brought back and slacked off slightly. 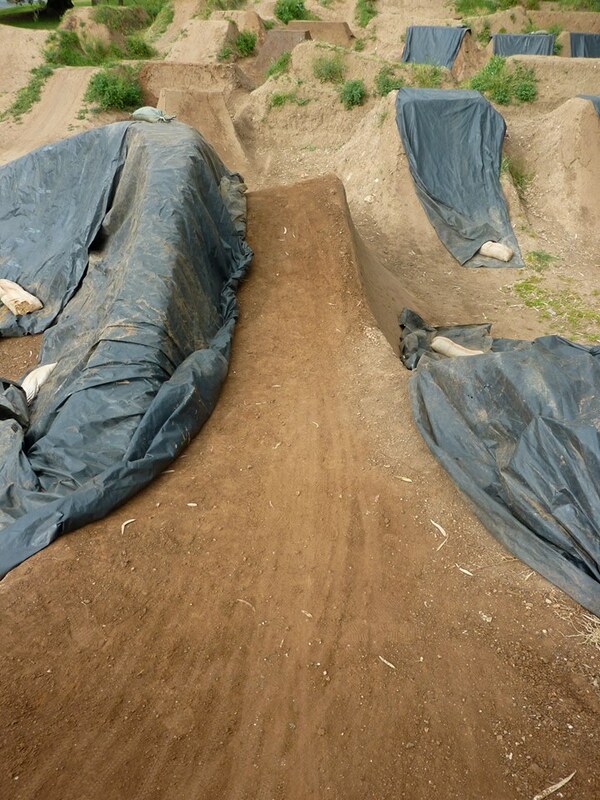 The jump following the entry hip of 'Speed Line' was changed into a single roller which lead into a double roller and jump into the berm. This set up made getting into Sausage Fingers relatively easy for the first time. 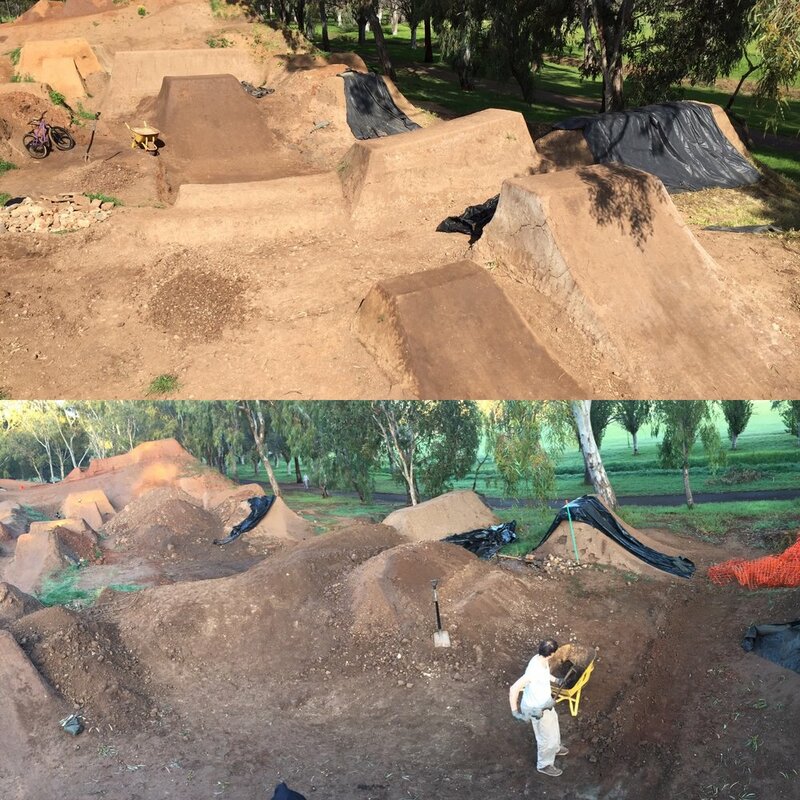 By far the biggest change was to the 'Return Set'; the idea was to dig down the bowls and to create more space between the jumps for more speed and better flow. The first jump's double wide landing was lengthened and the left hip on the 'Inside Return' was changed into a long-and-low. On the outside (next to Sausage Fingers) the previously unremarkable straight jump was turned into a steep poppy slight hip aptly named the 'Neckcracker'. After this, the two lines converge into one large lip and another double wide landing. The start hill was also further improved, with a path carved around the back so when a rider finishes a run they loop straight back to the stairs - ready for another. Below is some of the content that came out of 2016. At the start of 2017 the Adelaide City Council approached us with a desire to answer questions that insurance assessors, other councils and members of the public had been asking them for a while - How does this place operate? 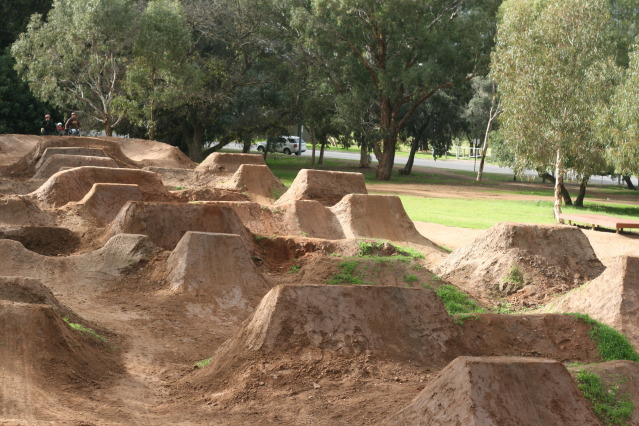 Until this point all club members ('The Crew') had been registered as volunteers, but with very minimal council oversight and little to no investment at the trails. After many meetings, and a lot of hard work, it was agreed we would maintain our role as volunteers, engage a third party trail building company for safety assessment/auditing and put in place a working operational framework. 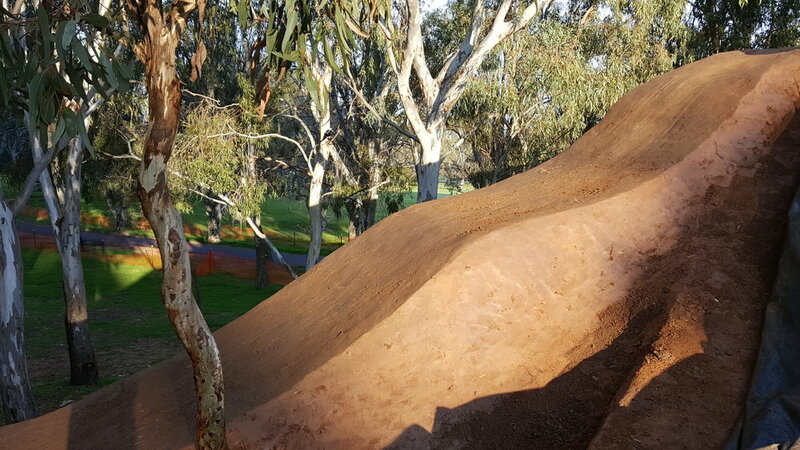 The two key outcomes of this was a council committment of ongoing support in the form of tools and supplies and a funding injection for the entire Kurranga BMX park. Aside from the obvious physical benefits of this, one of he biggest take-away's was the Council's willingness to recognise the efforts put into the park and provide support in a way that doesn't compromise the quality of the trails. The big hope of this is that it will have some profound positive affects on the park in the years to come. It will also provide a working model that can be used by other local governments and trail crews wanting an example of how to manage our unique sport. In July Callum and Nigel took a week off work for another dig week. The first time this had been done was in 2013, and this time around some valuable lessons had been learnt. Initially an excavator was organised to do the bulk earthworks, meaning the majority of the week could be spent shaping, packing and sculpting by hand. The focus of the work was removing the third jump in 'Right Set' and using the dirt (and space) to extend the landing of the second jump. 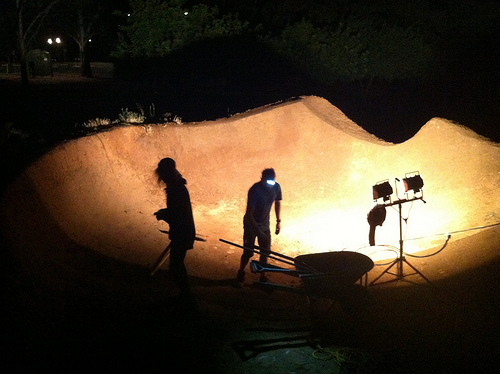 A roller was created in the new space and lead into a new step-up which transitioned into the completely re-built Return Berm/back section. During the dig week City Mag collaborated to create a short film and article about this role as creators and caretakers of City Dirt. Throughout the year the 'Fiskars' and 'Milkbones' lines were also modified to provide more progression and continuity with the larger lines. Some more 'subtle' changes were the addition of sumps, drain pipes and trees to better deal with heavy winter rains and water run-off. A number of low-key Jam's in April, October and December were also held. Although not the big events that Octoberfest had been in past years, all three days saw a good turn out and lot's of good times. The scene at the trails was stronger then ever in 2017 with the start hill frequently crowded by old and new faces alike. The persistence of previous years and the compounding effects of a strong trail culture were paying bigger dividends than ever - all the boys who started to ride the trails 5 to 7 years ago would often have things running smoothly in no time; it wasn't uncommon to turn up for a session and find the only thing left to do was ride. For the people who were still learning how to look after the trails this meant they could see the rewards of hard work and were more willing to get involved when asked. In 2017 City Dirt was by far the most dialled it had ever been - thank you to everyone who showed respect and shredded the trails hard. Below is some of the content that came out of 2017. 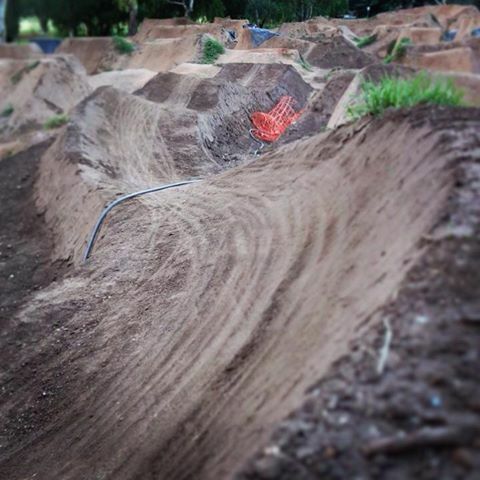 Building trails is like investing in the stock market; a lot of people want to get in and stack their money (or jumps) as high and as fast as possible, but end up watching it crumble when things don't go to plan. The best trails are the spots where people have held in over the years and worked consistently through the ups and downs. 2018 marked our tenth year at City Dirt and it was characterised by reaping the rewards of a decade’s worth of work, even as we continued to invest for the next decade. The year started with a follow-through of the Council’s willingness to support City Dirt we had seen in 2017, as The Trail Collective began work on several Council-funded upgrades. Initially this was the installation of a revised start hill complete with new staircase and metal handrails up to the edges of the start platform. This had little direct impact on the trails but made the previously steep edges more gradual and introduced some important fall-protection. At the same time, a new tool shed made out of a large concrete drainage culvert was half buried into the back berm at the northern end of the trails. The shed has enough room to keep all our tools in a neat and easily accessible space and represents a huge improvement for our digging work. To finish the shed off, we added a bluetooth enabled padlock (which allows us to easily grant or restrict access) and a custom set of door handles made out of some repurposed BMX bars (thanks Connor!). In May we attended the City Of Adelaide (COA) sporting club awards and were finalists in two categories; Club of the Year and Volunteers of the Year. Following this in November, Nigel was also nominated in the Council’s general awards night and won the award for 2018 Volunteer of the Year. These nominations and awards were a fantastic recognition of our volunteer work and a great way to bring the trails to the attention of the wider community. Having made several key layout changes over previous years, the digging work in 2018 was aimed at incremental improvements to the jumps and the wider park. We started the year reworking the unfinished ‘Shotgun’ line to make the features flow from start to finish. The berm after the ‘Shark Fin’ was pushed back and built-up to provide more room and the lip following was rebuilt to link back into ‘Fiskars’ hip landing. After this, we started reworking the start hill drop-in, changing it from a tight drop to a roll-in into ‘Right Set’ and a double-down roller into Fiskars. This enabled a simple relaxed pedal stroke before dropping-in, giving a faster and more controlled entry. We then adjusted the Right Set to work with this new speed by raising bowls, to distribute the downhill gradient, while also rebuilding most of the lips and landings. This was done in a progressive fashion starting with the first hip and working through the line, raising the levels jump-by-jump. With our confidence in the the overall layout of the space we also planted a number of trees throughout the trails, aiming for key areas of water run-off and low traffic. The goal of these plantings is to reduce some of the destructive rain run-off seen in winter and provide shade for riders in the years to come. The Council’s biodiversity team also donated roughly 150 native plants and mulch which was planted on the sides of the new start hill to stabilise the banks and create a low-maintenance native garden. Year-on-year we make comments like “the trails are running really well at the moment” but in 2018 the trails were always running well. While we have spent a huge part of our time digging at City Dirt the best rewards of the last ten years work have come from the riding. Not only were more lines, crossovers and options possible than ever before, but each line and combination flowed, making each session one to remember. For the first time since 2012 we didn’t hold a jam, but easily made up for it with a crew or regulars always down to ride. This would often be added to by new blood stepping up from the refreshed intermediate track or some nutter downside whipping the first hip! Below is some of the content that came out of 2018.